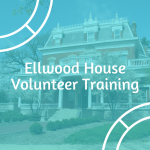 The Ellwood House will offer a volunteer training series on Friday, February 1 and Friday, February 8 for community members interested in becoming more involved with the museum. Each session will begin at 5pm in the museum’s Visitor Center and last two hours. The first day of the training series, on February 1, will focus on the story of the Ellwood’s, how volunteers can get involved, and sharing strategies for engaging with visitors. Anyone interested in volunteering is encouraged to attend this session. Those interested in becoming guides of the 1879 mansion or 1898 Ellwood-Nehring House are encouraged to attend the second training session on February 8, when staff will lead attendees through a tour and explain logistics. The museum is operated by the nonprofit Ellwood House Association in conjunction with the DeKalb Park District.